If match-racing practice makes perfect, then Cambridge University Men’s Boat Club will be well-versed in the complex and tricky art by the time The Boat Race rolls around in March. The annual Trial Eights culminated in a fantastic race between two crews of impressively high calibre as the Light Blues stepped up their preparation for The Cancer Research UK Boat Race 2018. The two crews, named Goblins and Goons, lined up on the Middlesex and Surrey sides respectively. Both crews stole away cleanly, churning up the water outside Putney Embankment and threatening to leave the flotilla of following craft in their wake. It was Goblins, steered by Cambridge Men’s President Hugo Ramambason, who took the early advantage of a couple of seats and maintained this around the early Fulham elbow. The crews battled for linear supremacy and drew level underneath the struts of Hammersmith Bridge. Goons, with Blue Freddie Davidson stroking the crew, began to edge ahead as they claimed the full advantage of their Surrey bend. Goblins were not easily quashed though, applying significant pressure despite their bend disadvantage. The crews drew level again, in a display of rowing which buoyed Goblins and led to them regaining the advantage approaching the Bandstand. An intense duel followed, whereby both crews took turns in attacking each other. 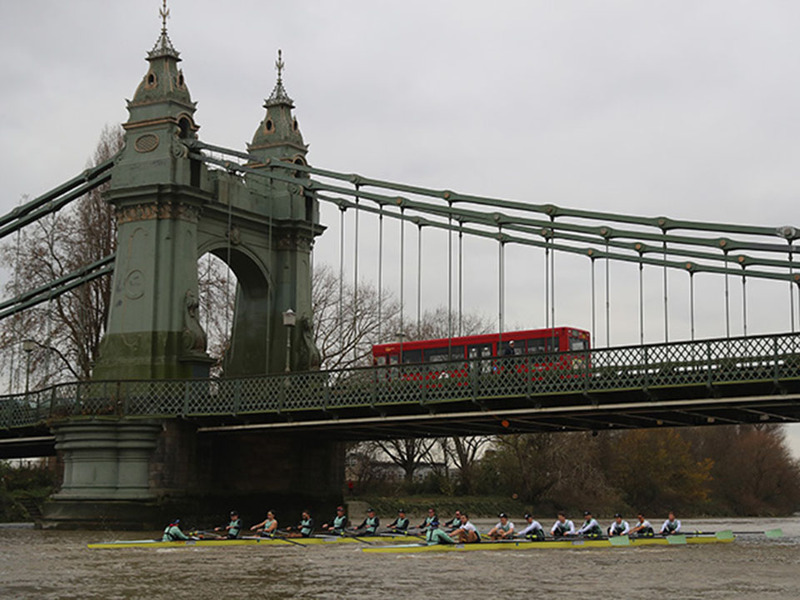 Goblins maintained their half length lead and shot the distinctive arches of Barnes Bridge under pressure from an increasingly desperate Goons boat. The pain was etched onto the faces of each of the 16 rowers as they wound through the gears approaching the finish. Crossing the line, it was Goblins who took the win by around 1/2 a length. Both crews collapsed over the line, exhausted after a fine exhibition of competitive match racing.